Protocols for utilizing open system flow biofilms with drip flow reactors and rotating disk reactors are presented in detail. Schwartz, K., Stephenson, R., Hernandez, M., Jambang, N., Boles, B. R. The Use of Drip Flow and Rotating Disk Reactors for Staphylococcus aureus Biofilm Analysis. J. Vis. Exp. (46), e2470, doi:10.3791/2470 (2010). Most microbes in nature are thought to exist as surface-associated communities in biofilms.1 Bacterial biofilms are encased within a matrix and attached to a surface.2 Biofilm formation and development are commonly studied in the laboratory using batch systems such as microtiter plates or flow systems, such as flow-cells. These methodologies are useful for screening mutant and chemical libraries (microtiter plates)3 or growing biofilms for visualization (flow cells)4. Here we present detailed protocols for growing Staphylococcus aureus in two additional types of flow system biofilms: the drip flow biofilm reactor and the rotating disk biofilm reactor. The drip flow biofilm reactor (available from Biosurface Technologies or custom designed versions can usually be made by university machine shops, see Figure 1) is assembled and autoclaved. Assembly involves affixing coupons in chambers and securing chamber lids. The chamber, along with biofilm medium (tryptic soy broth 2 grams/L and glucose 2 grams/L), and influent nutrient tubing are sterilized by autoclaving. Inoculation of the drip flow reactor is preformed by placing the reactor on a flat surface, clamping the effluent tubing lines, filling each chamber with 10 mL tryptic soy broth and adding 10 μL of a S. aureus culture grown overnight in tryptic soy broth. The inoculated reactor is then place in a 37°C incubator for 18 hours. After 18 hours of incubation, the effluent tubing is unclamped and the reactor is placed on a wooden block cut to a 10° angle. Aseptically connect the influent nutrient tubing to the bottle containing the continuous flow nutrient broth. Feed the tubing line through the pump and prime the tubes by running the pump at a maximum speed (will vary depending on pump model). Once the influent tubing is primed stop the pump and attach connect needles (22 gauge, 1 inch) to the end of each tube. Wipe the chamber inlet stopper with an ethanol wipe and aseptically insert the needles through the inlet stopper. Turn on the pump and allow the media to slowly drip (flow rate ~125 μL/minute) over the coupons. The media should flow downward along the coupon from the inlet stopper port to the effluent port. Operate the reactor in continuous flow for 2-5 days (depending on the application), occasionally checking the reactor for proper drainage. To harvest the drip flow reactor biofilms, stop the pump and carefully remove the needles from the reactor. The reactor can then be placed on a flat surface and the coupons can be aseptically removed using sterile forceps. If microscopy is desired, the coupons can now be processed accordingly (Figure 2B is a scanning electron micrograph of a S. aureus biofilm grown in a drip biofilm reactor). If quantification of the biofilm biomass or physiology studies are the goal of the study, the biofilm can be removed from the coupon using a cell scraper. While holding the coupons with forceps, gently scrape the biofilm off the coupon into a conical tube containing phosphate buffered saline using a cell scraper. Note: to quantify the colony forming units in the biofilms, it is necessary to homogenize the harvested biofilms with a tissue homogenizer to disaggregate clumps and form a homogenous suspension. Various models of tissue homogenizers are suitable for this application. We utilize a Fisher Scientific Tissuemiser Homogenizer (product # 15-338-420) at full speed for 1 minute to homogenize biofilm samples. Failure to homogenize the biofilm will result in an underestimation of the colony forming units present in the sample. The rotating disk biofilm reactor (available from available from Biosurface Technologies or can be custom made, see Figure 3) is assembled and autoclaved. Assemble the reactor by first place the spinning disk coupons into the slots of the spinning disc and placing it into a 1-liter glass beaker with an overflow port. A number 15-rubber stopper with holes drilled in it to allow media flow and aeration is used as the reactor cap. The reactor, biofilm media (tryptic soy broth 2 g/L and glucose 2 g/L), and inlet tubing are then sterilized by autoclaving. 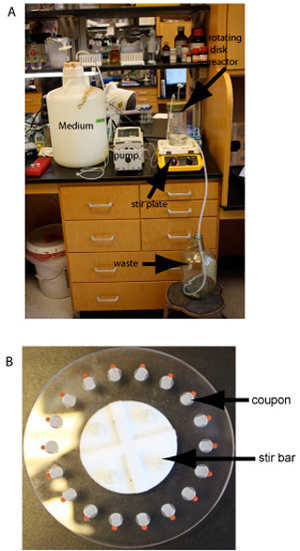 The rotating disk biofilm reactor is inoculated by placing 250 mLs of sterile medium into the reactor, and adding 0.5 mL of an overnight S. aureus culture grown in tryptic soy broth. The reactor is then placed on a stir plate set to 250 rpm and incubated overnight at the desired temperature. After 16 hours of incubation connect the inlet tubing to the port on medium reservoir and connect it to the peristaltic pump. The pump is then turn on and flow set to ~0.25 mL/min (flow can be altered depending on the growth rate desired). After 24 hours stop the reactor and aseptically remove the disc without touching the biofilm coupons. Remove the coupons using sterile forceps and dip each one into phosphate buffered saline to remove any loosely attached bacteria. For antimicrobial compound testing, the chips can be placed into individual wells of a 96 well plate containing compounds of interest. After incubation, chips are transferred into 1.5 mL microcentrifuge tubes containing 1 mL phosphate buffer saline and homogenized with a tissue homogenizer to disperse the intact biofilm. Cells are then serial diluted and plated onto nutrient agar medium to determine viable colony forming units. Note: many variations can be made on the above protocol. For example, spinning disk coupons can be coated with or made out of potential anti-biofilm compounds to test efficacy. Biofilm dispersants can also be evaluated be incubating coupons in dispersant compounds and quantifying bacteria attached versus detached. An example of a set up drip flow reactor is shown if Figure 1. After three days of flow copious amounts of biofilm will accumulate on the coupon surface, Figure 2A. The total biomass will vary depending on bacterial strains and precise growth conditions. A scanning electron micrograph of a S. aureus biofilm grown in the drip flow reactor is shown in Figure 2B. A rotating disk reactor is shown in figure 3A. The protocol described can be adapted to the specific requirements of generally any microorganism capable of forming a biofilm. Figure 3B shows the spinning disc with 18 plastic disks affixed. These disk-grown biofilms are particularly well suited for antimicrobial testing and yield highly reproducible results11. Figure 1. The drip flow reactor setup. Important components are labeled. Figure 2. Example of a drip flow S. aureus biofilm. A) This biofilm was grown for three days following the protocol described. Lids from the first two chambers of the reactor are removed to show the yellow S. aureus biofilm biomass. B) Sacnning electron micrograph of a S. aureus biofilm grown in the drip flow reactor. Figure 3. The rotating disk reactor. A) Example of a running spinning disk reactor. Key component are labeled. B) Close up view of a spinning disk. Biofilms grown in different reactors will often have different characteristics and each reactor has different applications. In this work, we describe the use of two biofilm reactors: a drip flow biofilm reactor and a rotating disk reactor. Drip flow reactors are useful for growing low shear biofilms at an air-liquid interface and are adaptable to a variety of conditions. We find them extremely convenient for studies where a large amount of biofilm biomass is desirable. This setup can easily be adapted for studies involving microsensor monitoring and the testing of potential antibiofilm surfaces. The rotating disk reactor is useful for growing multiple identical biofilm on remove disks under a moderate shear environment. The ability of this reactor to produce multiple identical biofilms on removable disks makes it ideal for studies involving the testing of antimicrobial compounds and biofilm resistant surfaces. 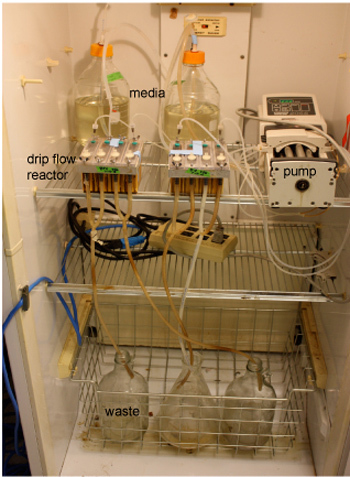 Many applications are possible when using these biofilm reactors and researchers are encouraged to modify the protocol to best model their specific research needs. These protocols provide alternatives to flow cell and static assays biofilms that have been used more extensively in the past. They may also provide a greater ability to mimic diverse clinical infections. However, there are potential limitations with each technique. For example, the drip-flow reactors and rotating disk reactors are not ideal for visualizing biofilms by confocal microscopy. Also, the physiology of biofilms grown in the different types of reactors will likely vary greatly. For example, the drip-flow reactor will result in a biofilm being exposed severe nutrient gradients, which is very different from the uniform laminar flow of nutrient media across a flow cell biofilm. Ultimately, the type of biofilm reactor utilized will depend on the questions being addressed and investigators should be aware that multiple biofilm reactor systems are available for their studies. Costerton, J. W., Lewandowski, Z., Caldwell, D. E., Korber, D. R., Lappin-Scott, H. M. Microbial Biofilms. Annu. Rev. Microbiol. 49, 711-745 (1995). Costerton, J. W., Cheng, K. J., Gessey, G. G., Ladd, T. I., Nickel, J. C., Dasgupta, M., Marrie, T. J. Bacterial biofilms in nature and disease. Ann. Rev. Microbiol. 41, 435-464 (1987). O'Toole, G. A., Kolter, R. Initiation of biofilm formation in Pseudomonas fluorescens WCS365 proceeds via multiple, convergent signaling pathways: a genetic analysis. Mol. Micro. 28, 449-461 (2002). Boles, B. R., Horswill, A. H. Agr-mediated dispersal of Staphylococcus aureus biofilms. PLoS Pathog. 4, e1000052-e1000052 (2008). 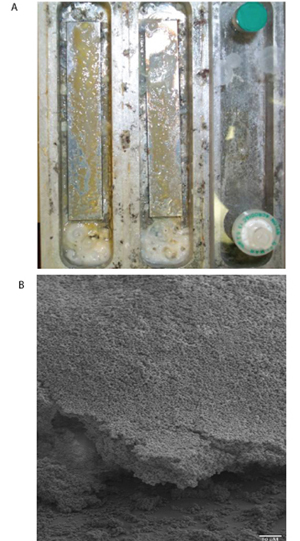 Goeres, D. M., Haamilton, M. A., Beck, N. A., Buckingham-Meyer, K., Hilyard, J., Loetterle, L. A., Walker, D. K., Stewart, P. A method for growing a biofilm under low shear at the air-liquid interface using the drip flow biofilm reactor. Nature Protocols. 4, 783-788 (2009). Fu, W., Forster, T., Mayer, O., Curtin, J. J., Lehman, S. M., Donlan, R. M. Bacteriophage cocktail for the prevention of biofilm formation by Pseudomonas aeruginosa on catheters in an in vitro model system. Antimicrob Agents Chemother. 54, 397-404 (2010). Xu, K. D., McFeters, G. A., Stewart, P. S. Biofilm resistance to antimicrobial agents. Microbiology. 146, 547-549 (2000). Xu, K. D., Stewart, P. S., Xia, F., Huang, C. T., McFeters, G. A. Spatial physiological heterogeneity in Pseudomonas aeruginosa biofilm is determined by oxygen availability. Appl. Environ. Microbiol. 64, 4035-4039 (1998). Boles, B. R., Thoendel, M., Singh, P. K. Self-generated diversity produces "insurance effects" in biofilm communities. Proc. Natl. Acad. Sci. USA. 101, 16630-16635 (2004). Pitts, B., Willse, A., McFeters, G. A., Hamilton, M. A., Zelver, N., Stewart, P. S. A repeatable laboratory method for testing the efficacy of biocides against toilet bowl biofilms. J. Appl. Microbiol. 91, 117-11 (2001). Boles, B. R., Thoendel, M., Singh, P. K. Rhamnolipids mediate detachment of Pseudomonas aeruginosa from biofilms. Mol. Microbiol. 57, 1210-1223 (2005). Hentzer, M., Teitzel, G. M., Balzer, G. J., Heydorn, A., Molin, S., Givskov, M., Parsek, M. R. Alginate overproduction affects Pseudomonas aeruginosa biofilm structure and function. J. Bacteriol. 183, 5395-5401 (2001). Lin, H. Y., Chen, C. T., Huang, C. T. Use of merocyanine 540 for photodynamic inactivation of Staphylococcus aureus planktonic and biofilm cells. Appl. Environ. Microbiol. 70, 6453-6458 (2004). Posted by JoVE Editors on 03/14/2011. Citeable Link.